Who Said Cinderella Had To Be Young? I immediately thought of Cindy when I saw these - and yes: it is a real ad campaign! The ads are by the talented people at JayGrey. 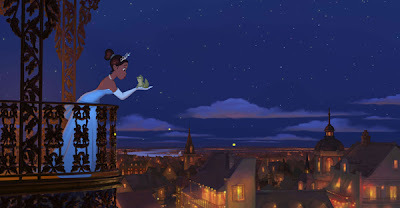 This sequence was released just over a day ago by Disney from their upcoming, much anticipated film "The Princess and the Frog". It's a continuous three minutes and twenty seconds and, it should be noted, most of the footage we've seen before in trailers, specials and featurettes BUT it is a treat to see the pieces put together in order, without cuts, edits and other narration interrupting. 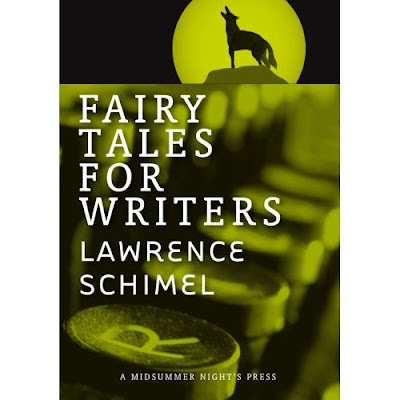 Since I posted about writing fairy tale based fantasy this week, I thought I'd draw your attention to a fun little book of writing advice that uses fairy tales to impart writing anecdotes and insights: "Fairy Tales For Writers" by Lawrence Schimel. It's actually a small book of thirteen, often funny, poems (don't worry - you don't need to love poetry to enjoy this one - it's very accessible for all types of readers). 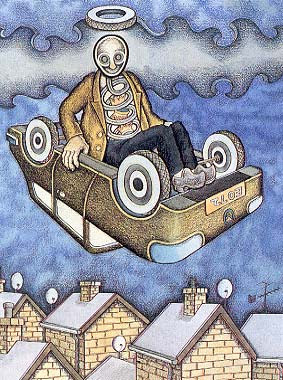 If you like metaphors, imagery and fairy tale archetypes you'll really enjoy it. 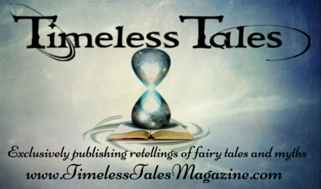 The tales are used very cleverly to illustrate issues in writing. One note: when I ordered this book a couple of years ago I was surprised to see how small it was when it arrived. The small size was deceptive. This is a very enjoyable (and useful) book and well worth its price. This small, slender, imaginative, hilarious, and all-to-true 30-page collection of poetry by Lawrence Schimel wonderfully and artfully reflects the almost archetypal hopes, ambitions, frustrations, passions, and processes of writing for publication. 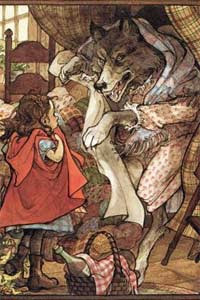 Here in a kind of poetic folklore format are 'the new writer who encounters a wolf along the path to publication'; the writing workshop member who must always be 'the fairest of them all'; the writer who for the sake of love gives up her own special voice; the shy, anonymous author who slips away before the end of the reading only to be remorselessly tracked down by the editor wanting to publisher her work. Everyone who has ever put pen to paper, and the tried to submit that paper to a publisher, will recognize the poetically expressed truths in Lawrence Schimel's superb little book, "Fairy Tales For Writers". As the last line on the last page of this marvelous little gem has it: "Sometimes there is a happy ending, even in publishing." You can read a SF Site review HERE. Click HERE to see more details and order. 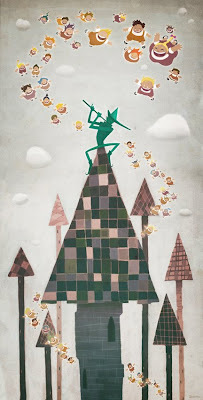 Illustrator Pedro Bascon is busy painting his own versions of some fairy and folktales for a 2010 calendar. I haven't seen a collection quite like this on a fairy tale theme and find that the strong design approach brings a new perspective and emphasis to aspects of the tale/s one may not normally think of. I love the simple but strong designs. It's not as easy to achieve as one might think. Pedro's work in using a forced 'canvas size' for the design is very pleasing to the eye and communicates the tales instantly - yet there's more to see if you look closely too. It's always interesting to see what results when you put restrictions on a creative work. 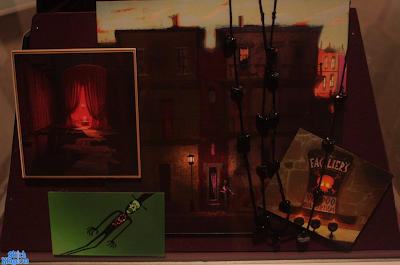 You can view some close ups of the pieces by going to his sample page HERE. You can also find out more about Pedro HERE and contact him directly to ask how to purchase a calendar if you're interested (he's very nice and approachable!). He is currently investigating how to make his calendar available in the US (his contact details are all on his home page HERE). Conference topics include the cultural and material history of fairy tales and the oral adaptation of stories and folklore across cultures. Internationally renowned faculty will present from a variety of fields on a wide range of subjects, such as literature, print culture and anthropology. 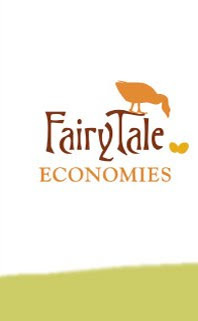 Events will include a workshop on how to teach a fairy tale, a reception at the Saenger Theatre and presentations by fairy tale scholars from around the world. I don't see Dr. Tehrani, who recently announced the results of his studies into the origins of fairy tales, on the speakers list but hopefully he makes an appearance. Ellen Ruffin, curator of the de Grummond Children's Literature Collection at Southern Miss, has developed an exhibit of fairy tale artwork titled "The Alphabet of Fairy Tales" for viewing during the reception, which Hillard said will be a "feast for the senses." Yay! I'm so please when a visual element is presented with fairy tales as I don't think anyone who grew up with a fairy tale book can completely divorce them from images of one kind or another. Illustrations are part of what makes fairy tales so impacting and resonant with people (I think) for so many reason (I'm sure someone's done a thesis on this topic somewhere!). 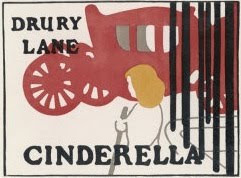 The first Panto production of Cinderella was at Drury Lane in 1804. And you can find out more about fairy tales and pantomime HERE (complete with old posters, movie clips and historical tidbits). You can read the rest of the details for the conference, including a program, HERE. If you have problems viewing the movie please go HERE to view. Golden Books routinely releases the Disney movie storybooks, complete with reproductions of scenes from the movies but did you know they often also release (usually for a limited time) a completely different version? 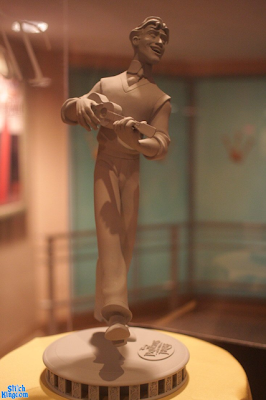 One that's often drawn/created by the current hot talents of character design and visual development for animation? 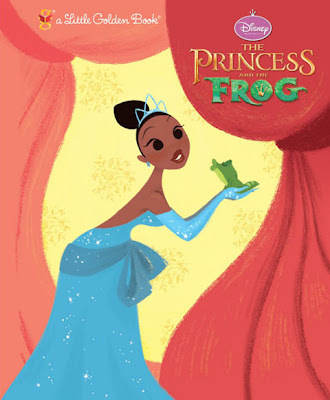 For "The Princess and the frog" that artist is the very talented CalArts graduate Lorelay Bove. (She also did the Toy Story picture book that came out on September 1st.) She's currently working at Disney in visual development. She just got the first print copies of her work for golden book and kindly gave us a sneak peek on her blog. (Thanks to Cartoon Brew for the alert!) The book goes on sale (for the very affordable price of $3.99 - hooray!) on October 13th, 2009. You can see larger views of the work above and a whole lot more of Lorelay's work on her blog HERE. 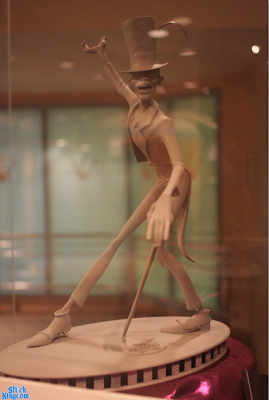 More Displays For "The Princess and the Frog"
This time the display is inside the Feature Animation Studios in Burbank, CA. 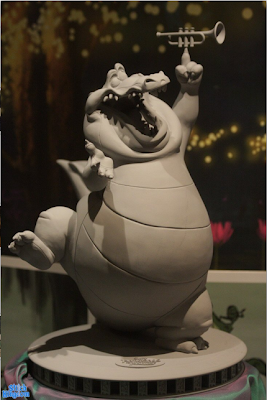 The pictures were kindly taken and shared by stitchkingdom.com for those of us who don't have the opportunity to go see them in person. Being a sucker for maquettes I'm showing you those as well as some other unique things that caught my eye but there's much more to look at HERE. 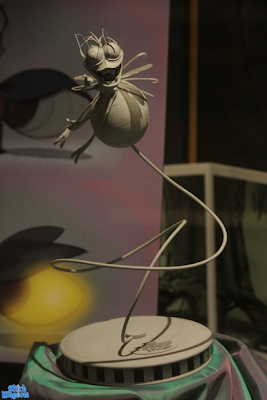 The maquettes (three dimensional models created specifically for - and used by - animators during the animation process, so they can see what the model looks like from any angle they need to). 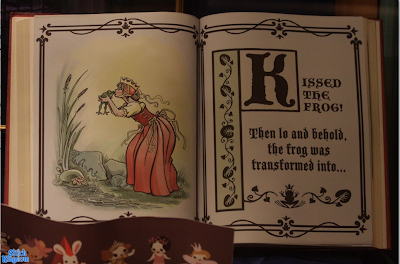 Glaring omissions from this display are the frog maquettes for both Naveen and Tiana. 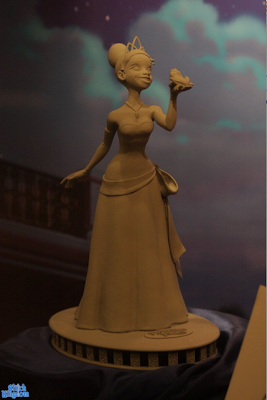 The little guy Tiana-in-princess-mode is holding below, isn't a very useful model, as far as I can tell. Want to see more? 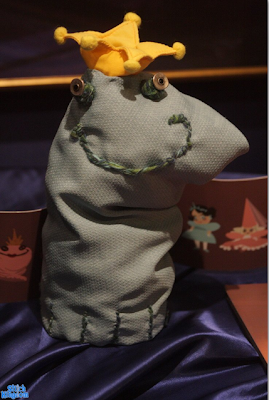 Click HERE to go to the photo gallery at stitchkingdom.com. Occasionally, the question comes up as to whether or not it's a good idea to write fairy tale-based fantasy works. To answer this, they called on authors Sophie Masson and Juliet Marillier; two writers who've built their career on writing fairy tale based fiction. Apparently both are quite passionate about the subject so the post has a second part coming with Ms. Marillier's response. The idea behind this wonderful fairy-tale is fabulous, as H.C. Andersen anticipates the "flying age" that we live in today. When he wrote the fairy-tale in 1839 nobody would have imagined, that the "flying age" would become a reality some centuries later... I did not change the motif that much when I modernized it. I turned the trunk into a car turned upsite down. I didn't want to turn the trunk into an airplane, as I wanted to express the preposterous idea that things can have other functions than they were meant to have. 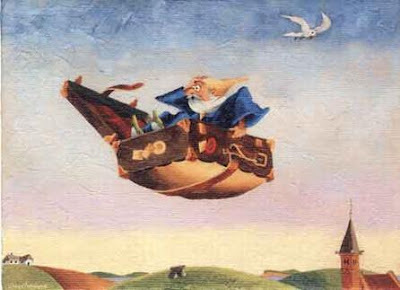 * I thought illustrations from The Flying Trunk to be appropriate as the main character in the tale, after losing his enchanted means of seeing a Sultan's Daughter (by way of the flying trunk of the title) ends up wandering the world telling stories. See more about the HCA tale (which draws from many older tales around the world) HERE. 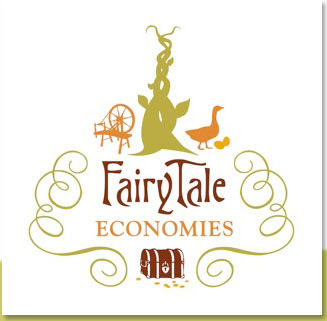 Starting September 27th, 2009 (tomorrow), the Museum of Texas Tech University is having an exhibition of original fairy tale art and I sincerely wish I could be there to see it! Original paintings, drawings and illustrations will be on display by such favorites as Trina Schart Hyman (one of my all-time faves) and Kinuko Y. Craft (how can you not love her work?) among others. The artworks reflect a variety of mediums such as watercolor, acrylic, colored pencil and mixed media. The magical settings for the stories are created by award winning artists including Kinuko Y. Craft, DEMI, Jane Dyer, Marilee Heyer, Trina Schart Hyman, Jim LaMarche, Barry Moser and Susan Paradis. The exhibit will be on display until November 22nd, 2009 and you can find more information HERE. 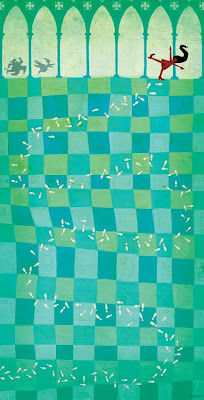 I so wish I could see Ms. Hyman's work in person! Set to debut this autumn for younger grade school kids, is Sandra: The Fairytale Detective. 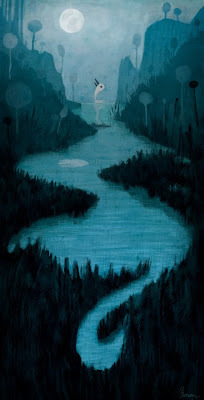 Sandra: The Fairytale Detective is... about a little girl, Sandra, who is the lone descendent from a line of fairytale detectives -- a perilous but necessary occupation. Although very few, if any people are aware of The Land of Once Upon a Time (where all of the fairytale characters live), even fewer are aware of the fairytale detective (who solves all sorts of mysteries therein). Roughly targeted toward children aged four through eight-years-old, Sandra: The Fairytale Detective uses a clever and inspiring color palette combined with a klutzy sense of humor to bring young viewers into the familiar realm of fantasy, but with a detective twist. Like many kids her age, Sandra gets into arguments with her classmates, doesn't clean her room very often, and enjoys taking on a good challenge. But when her assistant and friend Fo, a 500-year-old elf with the guise and spirit of a child, arrives to say that there's a problem over in The Land of Once Upon a Time, the girl dons her overcoat and jumps into action. Maybe the adorable puppet-boy Pinocchio is kidnapped, or maybe Cinderella loses her glass slipper… for real, or maybe Snow White's evil stepmother's mirror mysteriously goes missing. 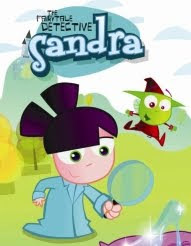 Sandra is on the case; the kid detective lives for the challenge of the mystery, often using some convenient and humorous blend of magic and deductive reasoning to solve each riddle. BAD WOLFE - Three Little Pigs. 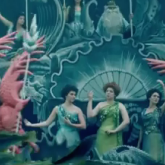 BUBBLES - The Little Mermaid. 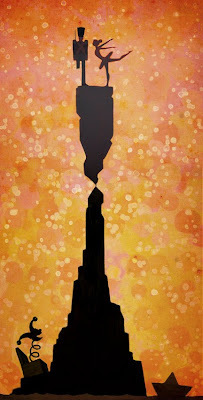 THE GOLDEN KEY - Hansel & Gretel. A PRODIGIOUS NOSE - Pinocchio. THE MISSING SLIPPER - Cinderella. PESKY RODENTS - Pied Piper. INVENCIBLE DRAGON - Saint George´s Legend. 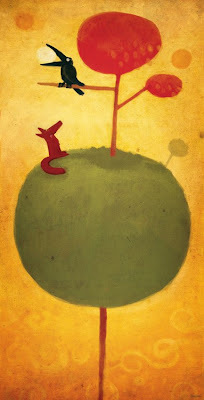 FRUITS OF THE FOREST - Little Red Riding Hood. THE OUTLAWED CAT - Puss In Boots. THE CURSED APPLE - Snow White. THE ROYAL EGG - Ugly Duckling. KING OF MORTADELA - Pinocchio Case 2. 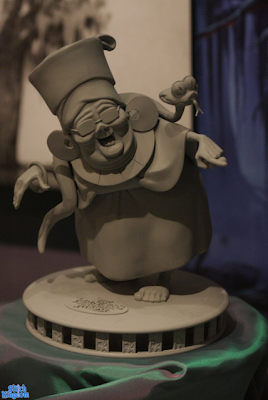 EVEN MORE DIFFICULT - Beauty And The Beast. A QUESTION OF SMELL - Jack And The Beanstalk. ASSAF THE SORCERER - Aladdin. THE WILD PARTY - Tom Thumb. THE MISTERIOUS CRYSTAL BALL - The Princess And The Pea. SHOW US YOUR PAWS - The Wolf And The 7 Little Kids. FOREST WITHOUT MAGIC - Rapunzel. THE THREE ANCHORS - Cinderella Case 2. THE WATER OF LIFE - The Shoemaker And The Elves. TOY ROOM - The Steadfast Tin Soldier. DIE LAUGHING - Emperor´s New Clothes. THE 22.30 EXPRESS - Little Red Riding Hood Case 2. HONEY SHAMPOO - Goldilocks & 3 Little Bears. 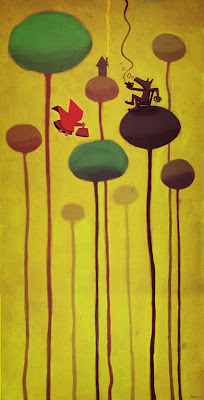 ACORNS - Little Red Riding Hood Case 3. AVALON ISLAND - King Arthur. THE REPEATING GHOST - Fearless John. THE FAT WORM - Thumbelina. THE RIDDLE CHAMPION - Rumpelstiltskin. 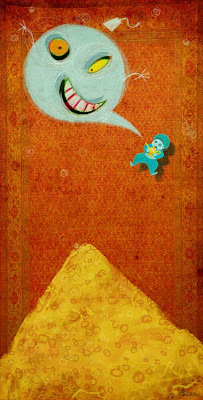 THE GUIDE´S SERVANT - Ali Baba. 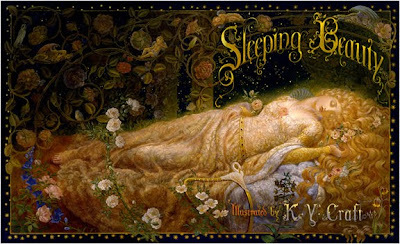 THE SECRET BOOK - Sleeping Beauty Case 2. 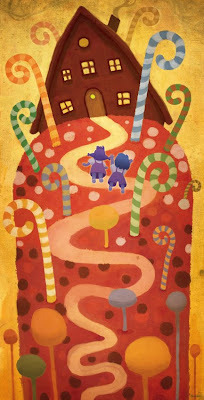 THE MAGIC FACTORY - Hansel & Gretel Case 2. THE GREAT MANDFREDI - The Bremen Town Musicians. THE FORBIDDEN ROOM - Bluebeard. THE PRINCE OF THE POOL - The Frog Prince Case 2. SIMPLETON - The Queen Bee. 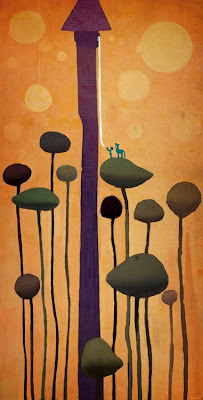 GIANT LOVE - The Brave Little Tailor. CAPTAIN BLACKBEARD - The Little Mermaid Case 2. THE SUPREME LAW - Sinbad. THE CUP FINAL - The Snow Queen. BROTHER OGRE - Puss In Boots Case 2. SCHOOL FOR PRINCESSES - Snow White Case 2. THE PRINCESS OF THE LAKE - Swan Lake. AN UNFORGETTABLE JOURNEY - Three Little Pigs Case 2. THE MAGIC HARP - The 12 Dancing Princesses. SCOLYMUS - The Sorcerer´s Apprentice. PETUNIAS - Snow White Case 3. Did you notice BLUEBEARD is on the list? I'm very curious to see how that's presented by and for kids beyond a blue-bearded dude! The website HERE has a LOT of information about premise, characters and episodes. You can see some artwork of both characters and locations (although the cutesy look isn't really to my personal taste I do like the landscapes I've seen - very interesting design work!) and there's even an episode to watch. Here are the Spanish titles (you can see an English version at the website) - they give you a good idea of how the cartoon will work. It'll be interesting to see how this affects how fairy tales are thought of. If the series does well, becoming part of the standard viewing component for children, we should see some interesting developments regarding fairy tales in the years to come. 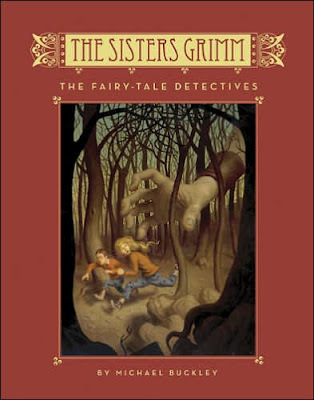 I couldn't let a post on a fairy tale detective go by without mention the recent hit novel series for kids called The Sisters Grimm. It's one of those "why didn't I think of that?!" ideas that's obviously striking a chord with kids (and older readers) everywhere. The series was created (and is being written) by Michael Buckley and follows apparent orphans (their parents were kidnapped) Sabrina, 11, and her sister Daphne, 7, who are adopted by their eccentric granny. The granny has some odd secrets she shares with the girls, clueing them in on their heritage, involving them in her detective work among the fairy tale inhabitants of a small town. You can see an image of the first book above (there are seven so far). If you're not familiar with the series but are interested, I recommend finding the lovely cloth bound hard covers. With old-fashioned rough cut pages and wonderful illustrations every so often, they're the sort of books I think of when people say 'book'. The WEBSITE is a lot of fun too! 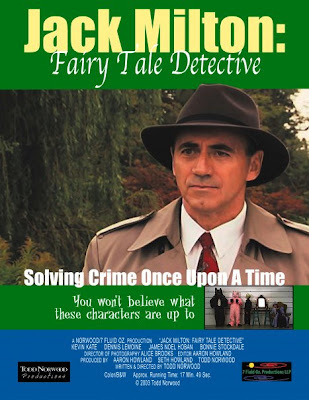 "Jack Milton: Fairy Tale Detective"
I recently discovered another fairy tale detective: "Jack Milton: Fairy Tale Detective"
Apparently this 18 minute short film won awards on the film festivals circuit! And don't let the funny animal costumes put you off - it's not really for kids. It was a fun film to shoot and it was a blast to travel the festival circuit with it. The cast is great in this and I met many long time collaborators who I’ve worked with many times later.. I sometimes get asked if there are any continuing adventures of Detective Milton and Tom Thumb. And the immediate answer is “yes.” I wrote a feature script about them. 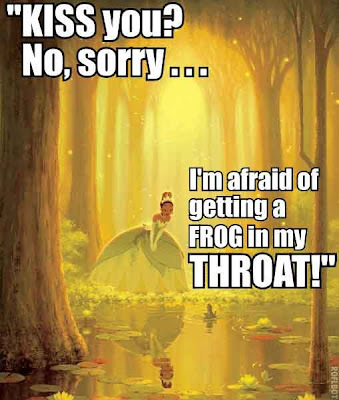 It follows our two intrepid heroes as they join forces with his estranged girlfriend, Snow White, and a new character, Freddy the Frog, (really the Frog Prince) as they uncover a worldwide conspiracy affecting all of Fairy Tale land. The script uses select scenes from the short and spins it off into new directions. It’s very much a mystery/road trip flick, and introduces a lot of other famous characters in strange situations. The film looks like a lot of fun so I'm really interested to see what a feature film would be like. In the meantime, hopefully Todd will release this little one on DVD. During October the Québec Intercultural Storytelling Festival is set to take over many of the public venues in the city for their events and programmes. German storytellers who are special guests of the Quebec Intercultural Storytelling Festival will enchant your ears with traditional German folk and fairy tales for adults. Come discover the metaphors, Freudian slips, violence, beauty and poetry of these stories, which have crossed the ages and still speak to our hearts and imagination today. You can find more information about the presentation HERE. The 10th edition of the Québec Intercultural Storytelling Festival will take place from October the 16th to the 25th, in concert venues, libraries, and theatres around Montréal, Québec City and the Eastern Townships. More than 130 events will be presented, in French and in English, by no less than 120 storytellers. This year, the Festival's English Section is featuring artists from Germany, Israel, England, the Yukon, Ontario and Québec. You can see the other events planned and look at the amazing number and range of talented storytellers coming to town for this event HERE. It's worth tracking down the out-of-print titles. 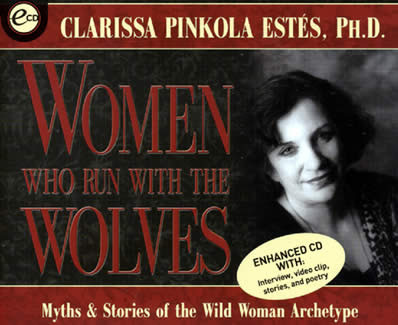 I especially enjoy how she uses a mix of well known tales and lesser known ones from all over the world. The result, at least for me, is that it makes it clear how tales can transcend boundaries of race and culture because the human experience is same the world over, albeit in different forms. It's good to be reminded of that from time to time. I want some! Only thing is, I'd end up tripping, falling, and end up with awful bloody feet with a doctor picking the glass out of my foot. 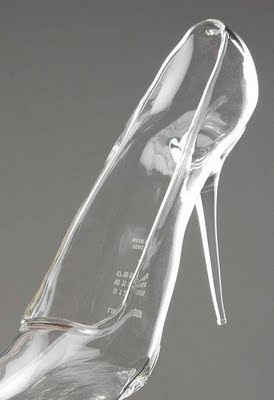 I have a horrible image in my mind of someone trying to wear these and the glass heel going straight into their foot. 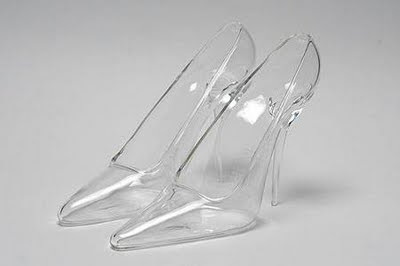 I think you would need some hot toes/feet to pull off glass slippers. Cinderella didn't have bunions, yo. 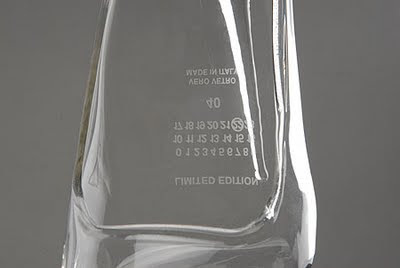 Available at Maison Martin Margiela* stores in Hong Kong (possibly elsewhere, too). HK$9,899 each. Did you really think Cindy's slippers would come as a pair? Looks like you opt for either a daily dust & windex or a painful evening ending with a date with a doctor... Ah-ha! I just discovered our heroine's back-up plan! Pixar's First Fairy Tale: "The Bear and the Bow"